As Europe marks May Day with holidays, I thought that it would be appropriate to revisit the issue of inequality again. In a past post (see Inequality and the genetic lottery: Two views), I showed that while global inequality has improved from 1988 to 2008 because of globalization as emerging market economies growth outperformed, wealth and income inequality within developed market countries have widened because the middle and working class in those countries lost because of the globalization trend. The winners were the top 1% and most of the emerging market world, while the losers were the poorest, largely because people in subsistence economies didn't participate in the benefits of globalization, and the middle and working class of developed market economies. To me, the issue of inequality has never been about the fairness of the results, but should focus on the equality of opportunity. Imagine three people who were born at the same time named Bill Gates, all of whom had the same intelligence and abilities. Bill Gates 1.0 is the successful billionaire that we all know today. Bill Gates 2.0 was born a poor black kid in the American Deep South. Bill Gates 3.0 was born to a poor family living in a subsistence economy in Africa. How can we create conditions so that Bill Gates 1.0, 2.0 and 3.0 all have equal opportunity? Given that kind of framework, the question then become a question of development economics. I have found neo-classical models of economics and the theory of comparative advantage does not explain everything. We all know about the economic miracles of China and India in the last 20-30 years. For me, the key question isn`t about India or China, but why did India and China succeed but not Kenya or Egypt, as they are all sources of cheap labor? I have encountered a number of promising approaches. I have written about the works of Michael Porter and Jane Jacobs (Jacobs and Porter on development). The Porter book, The Competitive Advantage of Nations, asserts that competitive advantages are not static, but evolve over time. Porter went on to outline how the economies of countries evolve as they move up the value-chain. Jane Jacobs published her work well before Michael Porter did and she is not as well known because she is more of an academic. However, her framework of moving up the value-chain framework is the same as Porter. What I find attractive about Jacobs is she identified the city-state as the unit of development, rather than a country, which makes sense to me as some countries can be highly economically diverse. The question of how to resolve inequality isn't purely academic. The images from places like Baltimore and Ferguson are a reminder of how the effects of income and wealth inequality can boil over. Applying sound development economic solutions to the inequality problem will go a long way in alleviating much of those social tensions. Despite the attractiveness of the Porter-Jacobs framework, it doesn't go fully in addressing some inequality problems. It`s may not be enough to ensure that people get equal opportunity, but how they go about attaining wealth and how they behave after they acquire wealth is also an issue. In other words, there seems to be a cultural element to development economics. Are these people just stupid? If so, why does America spend weekends adoring people who run around a field with what amounts to the IQ on back of their sweaters? Finance professionals know about the importance of a financial plan. "Winging it" is not a plan and can lead to disaster. Undoubtedly, that`s what happened to many NFL athletes who suddenly came into a lot of money. Were they irrational by ignoring the life-cycle hypothesis? A simpler explanation is that they were just "winging it" - and that approach creates a lot more risk to their lifestyle and future standard of living. The taboo against talking about money among people with inherited wealth has three main dimensions, he says: 1. inter-generational, in which parents and children don’t discuss money with each other, 2. publicity, in which wealth is not publicly disclosed (to the dismay of charities), and 3. peers, in which one does not discuss wealth with friends or colleagues so as not to either embarrass them or feel ashamed yourself. In fact, he says, those with inherited wealth often live frugally on purpose and drive Toyotas or forgo yachts because their inheritance is not growing dramatically, and the principal has to be protected from generation to generation. One question Fryer has addressed is what causes the achievement gap. Along with Levitt, he found something very interesting. In kindergarten, the black-white gap can be entirely explained by a small number of variables, including socioeconomic status. But as the kids got older, a new racial gap appeared that wasn’t explained by those factors. That means that some other force is at work -- education, discrimination, cultural factors or something else. Fryer set about trying to find those factors. For example, many have long argued that black culture discourages intellectual achievement, by branding academic pursuits as “acting white.” Along with co-author Paul Torelli, Fryer investigated the hypothesis. If academics are really considered “acting white,” then it stands to reason that getting good grades should be negatively correlated with popularity. Using data from a survey that asked students who their friends were, Fryer and Torelli constructed a measure of how popular each student was among members of his or her own race (the index is constructed so that having more popular friends confers more popularity than having less popular friends). The results fit the predictions of the “acting white” hypothesis -- as students get older, the correlation between grades and popularity goes up and up for white kids, but down for black kids. An alternative hypothesis, of course, is that racial discrimination is the cause of the black-white achievement gap. Many teachers, if asked, will tell you that this is the case (though they will probably deny that the discrimination comes from their own classrooms!). It’s a very hard thing to measure. But, as Fryer and others have documented, racial discrimination has become less and less important in the U.S. employment market. That doesn’t prove that discrimination isn’t still the culprit at the grade school level, but it is suggestive. Taken all together, Fryer’s work suggests that educational investments, improved motivation and cultural change have a good shot at closing the stubborn achievement gap between black and white students. That isn't going to please education reform opponents such as Diane Ravitch, who denigrate charters and pooh-pooh the idea that better education could close the gap. It’s also not going to please a lot of conservatives, who typically oppose funneling more resources into government-funded education. But Fryer’s message -- that the achievement gap isn't invincible, that it can be slain by better education -- is backed up by solid data and sophisticated empirical techniques. Those who deny Fryer’s conclusions will have a very hard time refuting the Clark Medal winner’s research. Basic training for economist involve a common framework for understanding human behavior. First and foremost, we assume that people are rational actors. The Washington Consensus, which has come to dominate economic thinking, believe in the Invisible Hand of the markets. When the rubber hits the road in development economics, it can be very messy and un-PC. The neo-classical solutions that the markets will take care of everything risks the kind of social instability seen in places like Ferguson, Baltimore, or worse. 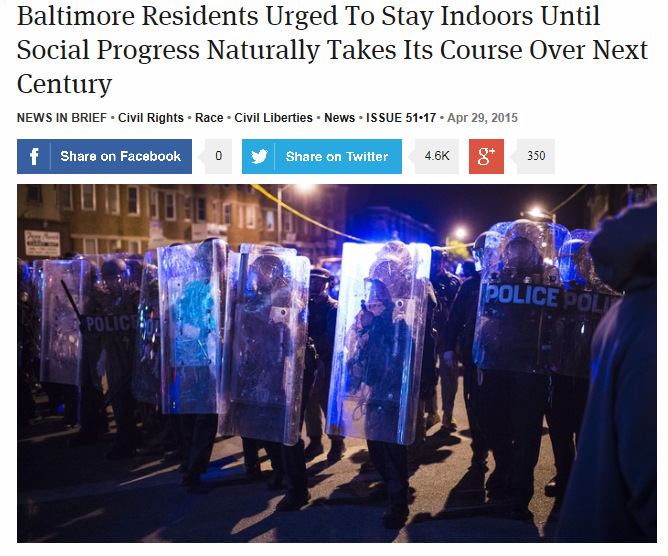 Sometimes, even The Onion just nails a headline. The Porter-Jacobs framework gets us part of the way there, but the results cannot be generalized. Yes, you can use comparative advantages, such as low labor costs and convenient geographic proximity to markets, to spur development. You can then leverage your position to educate your population and move up the value-chain with goods and services with more design elements and intellectual property, which creates better paying jobs. Still, it doesn't explain why India and China succeeded and Kenya and Egypt didn't. The third element is the messy part and it is politically incorrect. It involves a study of the culture. to understand the elements of success and their impediments. Those solutions can be highly specific and may not be generalized to the rest of the human population. Consider the following question. Both the Jews and the Romani (Gypsies) have historically been outcasts in Europe. How did one group succeed and acquired power (e.g., the Rothchilds) and the other remains shunned throughout the region? I've spilled a lot of ink about how capital expenditures have been missing in this cycle (for examples see CapEx: Still waiting for Godot and CapEx is still MIA). 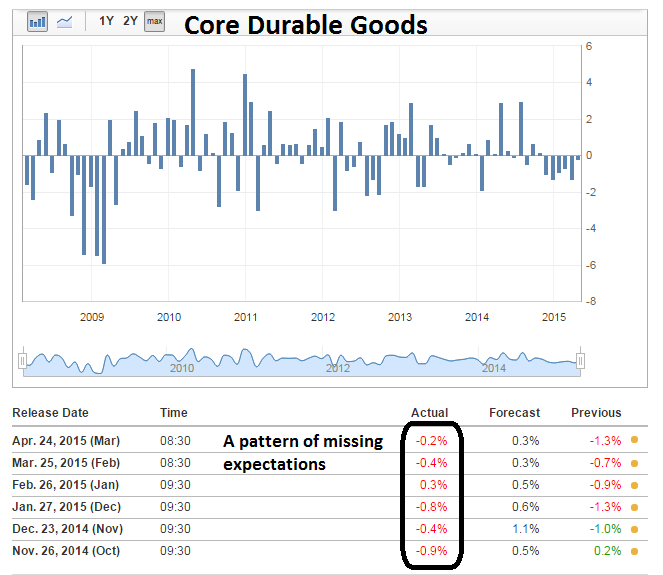 Last week, Durable Goods Orders continued a pattern of missing expectation. 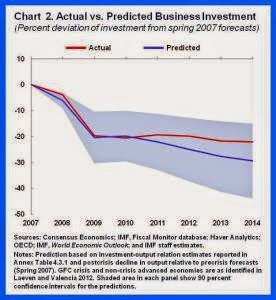 Using a novel statistical approach that deals with reverse causality running from investment to output, we confirm that business investment has deviated little from what could be expected given the weakness in economic activity (see chart 2). In other words, firms have reacted to weak sales—both current and prospective—by reducing capital spending. Indeed, when businesses are asked about the main challenges facing them, they typically report lack of customer demand as the dominant factor. Covering various time periods, growth accounting studies show a positive relationship between business investment in KBC and macroeconomic growth and productivity change. It is estimated that between 1995 and 2007 27% of labour productivity growth in the United States was explained by investments in KBC. Across Europe, investment in KBC accounts for 20 to 25% of average labour productivity growth. And research indicates that Canada’s GDP and labour productivity growth would have been 0.2 percentage points higher between 1976 and 2000 if previously excluded KBC were included in the national accounts as investments. Estimates for the 27 EU countries show that once business’ spending on KBC is treated as investment, measured labour productivity growth increases in all countries. In national accounts, treating KBC as investment, rather than intermediate expenditure, generally increases the contribution to overall growth coming from capital deepening (i.e. from a greater use in production of the capital represented by KBC). Growth accounting, however, does not explain the causal determinants of growth. Nor does it explain the complementarities between those determinants. Econometric methods are needed to tackle this challenge. Considering human capital and R+D – two forms of KBC – research has established their positive and significant impacts on macro-level productivity and growth. For instance, raising average educational attainment by one year has been estimated to increase aggregate productivity by at least 5%. R+D not only enlarges the technological frontier, it also enhances firms’ technological absorptive capacity. Micro-econometric studies often find private rates of return to R+D in the range of 20-30%. This is generally higher than the returns to physical capital, which is consistent with the higher risk associated with KBC. And the spill-over effects of R+D, while hard to measure precisely, are usually found to be large. 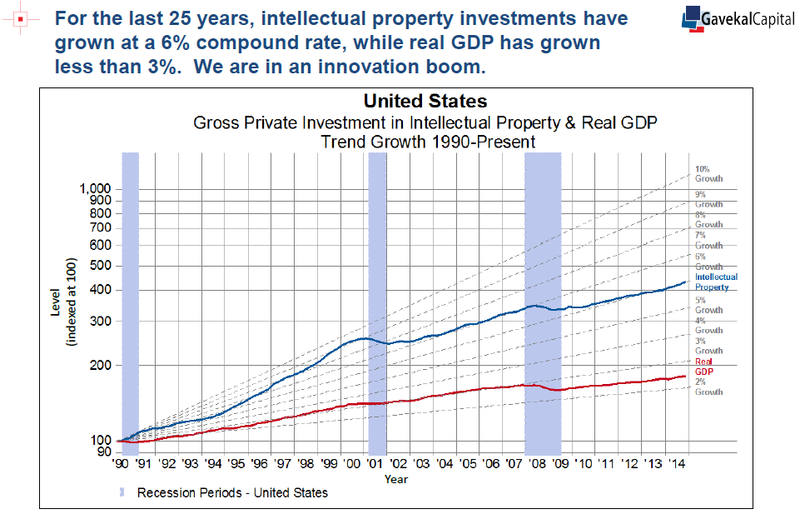 Indeed, there is some empirical evidence that KBC, or intellectual property, is becoming more important. 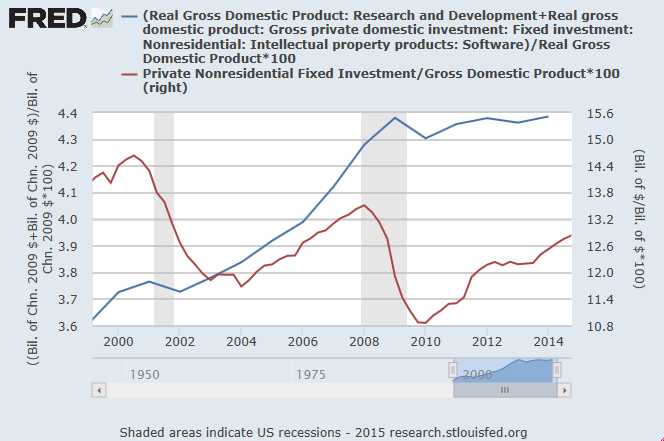 The FRED graph below depicts R+D and software as a % GDP (blue line) and Private Nonresidential Fixed Investment, or CapEx, as a % of GDP (red line). Notwithstanding the different scales, the chart shows that while CapEx tanked in the wake of the last recession and has not recovered, investment in intellectual capital has been flat during the same period. Further, Gavekal has a fund based on investing in what they call "Knowledge Leaders" based on the idea that the world is undergoing an innovation boom. The latest update indicates that fund has outperformed its benchmark. Note that this post is not an endorsement of their fund or strategy. Gavekal states that they use a quantitative process to identify "Knowledge Leaders". The history of performance may be due to other transient factors, such as sector and industry tilts - do your own due diligence. Nevertheless, these results from FRED and Gavekal present a possible explanation that the returns to intellectual property, which is intangible, is higher than the returns to tangible property, which is measured by traditional accounting techniques. This proposition is a propos in a week when the market has focused on the earnings reports of companies like AAPL and TWTR. New highs = A last hurrah? All-time highs a last hurrah? The NASDAQ and SPX closed at an all-time highs (ATH) on Friday. While new highs are generally interpreted bullishly as they are signs of surging momentum, momentum factors have not been working lately and the ATH could be seen as warning signs for bulls. The last time the SPX and COMPQ made ATH together was December 31, 1999 - a sobering thought! Despite the signs of apparent strength, I stand by my assertion that US stocks are in the process of making an intermediate term top. 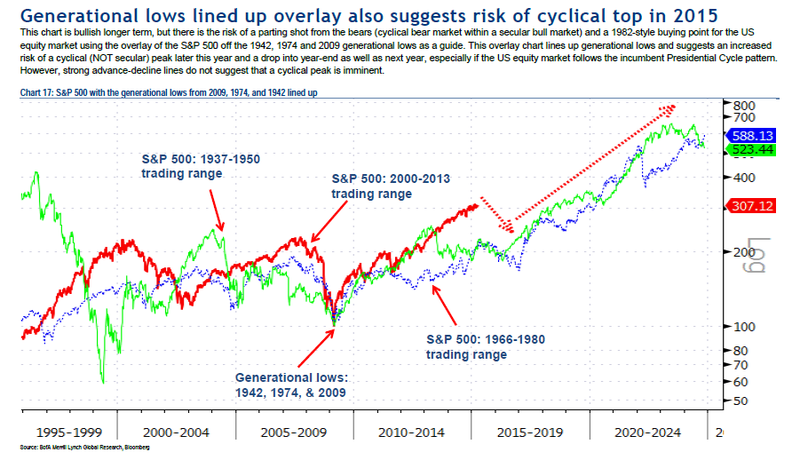 Stephen Suttmeier of BoAML recently warned about the risk of a cyclical top within a secular bull based on past historical patterns. In the past few weeks, I have also been writing about how the stock market price trend is looking extended and short-term momentum appears wobbly. My analysis was based a study done by James Paulsen of Wells Capital Management, Such conditions typically see a price reversal in the next few months (see How to make your first loss your best loss). In addition to these ominous technical warnings about a possible intermediate term top, I have also seen a number of well respected investors and analysts turn more cautious recently. As an example, investment legend Julian Robertson (see interview here) is worried about a stock market bubble. Short candidates are easy to find, but as noted above, the opportunity set on the long side is quite constrained. Most of the investment theses we have reviewed over the past several months can at best be described as late-cycle opportunities, with valuations that often ignore historical economic sensitivity. The operating (and in some cases activist) execution needed to achieve target results has to be rated at Triple Lindy difficulty level. Some of these challenges are well known, including lower energy prices directly impacting that sector (along with many companies that have benefitted from the domestic boom in energy development), and a stronger dollar reducing the translated effect of foreign earnings. Less discussed is the productivity bust and its impact on peak margins. At the bottom of the cycle, firms cut labor faster than output. The higher productivity led to improving margins, earnings and stock prices. Now labor is being added faster than output, and with large companies like McDonalds, Wal-Mart Stores, Inc. and Target announcing pay increases, unit labor costs are likely to increase further. All told, there is a good chance earnings will actually shrink this year. We think the market is too high if earnings have, in fact, peaked for the cycle, and we have reduced our net exposure by adding more shorts. I had previously pointed to analysis from Ed Yardeni that forward margin estimates were rolling over (see Earnings headwinds in 3 charts). Yardeni is another previously bullish analyst who has turned more cautious on the basis of excessive valuations (summary on his blog, but details are only available to subscribers). 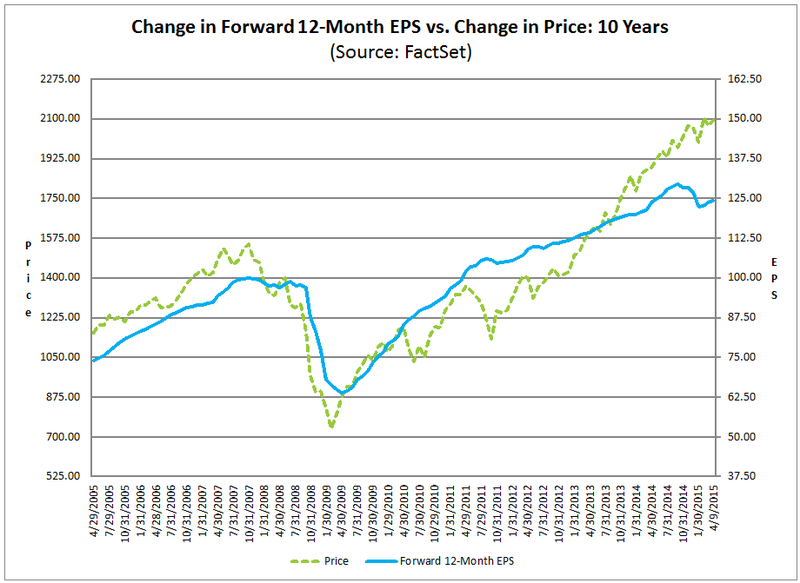 Indeed, forward EPS continues to fall as Earnings Season gets into full swing. The latest update from John Butters of Factset shows the earnings beat rate to be 73% (vs. 5-year average of 73%) but the revenue beat rate is a disappointing 47% (vs. 5-year average 53%). In other words, the preliminary report card from the current earnings season is a bare pass despite the Street lowering the bar by dropping estimates. 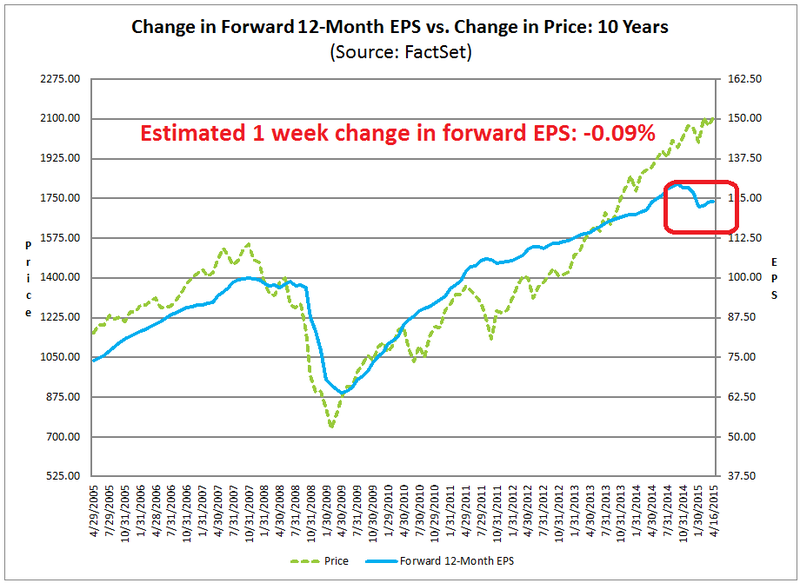 My own estimate of forward EPS estimates, based on blending FY2015 and FY2016 estimates from Factset data, shows that forward 12-month EPS edged down -0.09% last week, compared to -0.29% the week before. 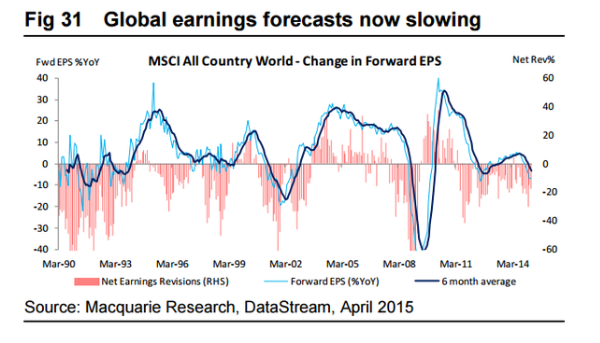 Looking globally, research from Macquarie (via Nick) indicates that global earnings estimates are also falling. Despite these warning signs, my base case scenario does not call for a full-blown bear market, but a correction much like the experience of 2010 or 2011. 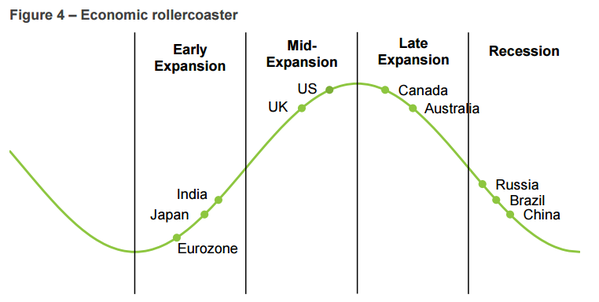 The chart below shows a stylized depiction of where different countries are in their economic cycles, while there may be a few minor quibbles about the exact positions, the key takeaway here is that the US is in the mid-cycle phase of an economic expansion and a recession, which is the major catalyst for a bear market, is not on the horizon. Analysis based on sector leadership point to a market that is being held up purely by risk appetite, or speculative sentiment. I pointed out in my last post that Consumer Discretionary stocks looked a bit wobbly on a relative basis (see Someone is going to be very wrong on the American consumer). While these stocks have recovered a bit of relative strength, what struck me was that the relative weakness of Consumer Discretionary stocks was widely based and across the board. Using the same techniques of measuring relative strength, I went looking for signs of market leadership to measure where the market believe the pockets of economic strength are. So what`s holding up this market? Surprisingly, it`s the high-beta glamour groups of the stock market (plus Healthcare, which has shown a consistent pattern of relative strength). The relative strength of a number of key sectors, such as Financials, defensive sectors (Consumer Staples and Utilities) and resource sectors do not show any sign of leadership either. The disappointing relative performance of the heavyweight Financials and its high beta cousin the broker-dealers is disappointing. Moreover, analysis from Nautilus Research that this kind of relative weakness in financial stocks is bad sign for stock prices going forward. The lack of defensive leadership is a sign that the bears aren`t about to stage a major charge. Resource stock relative strength is stabilizing, but they do not appear to be ready to stage a major advance yet, as they probably need time to base and consolidate. What about cyclical sector? Meh! 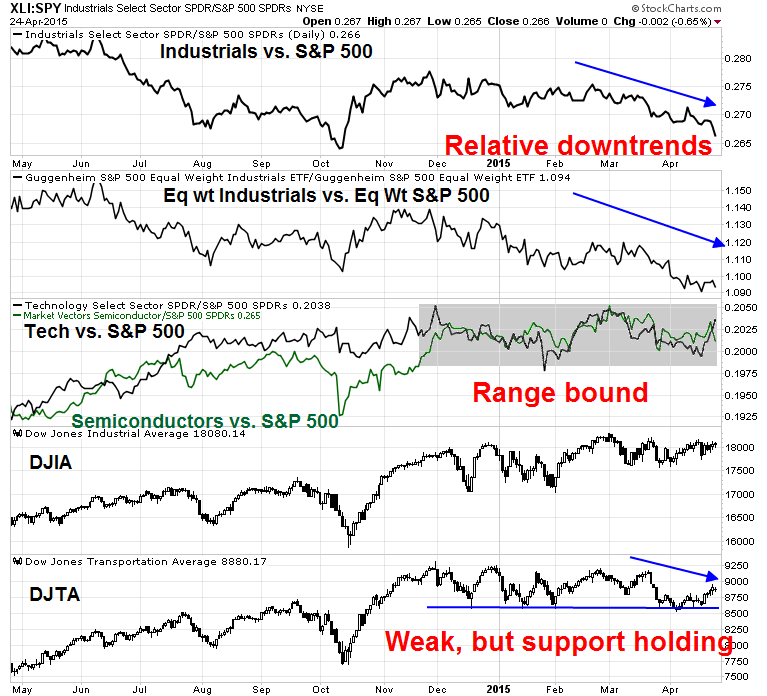 The chart below depicts the relative strength of Industrial stocks (also equal weighted because of the influence of heavyweight GE), semiconductors (and growth cyclical Technology stocks), as well as the the transportation sector. 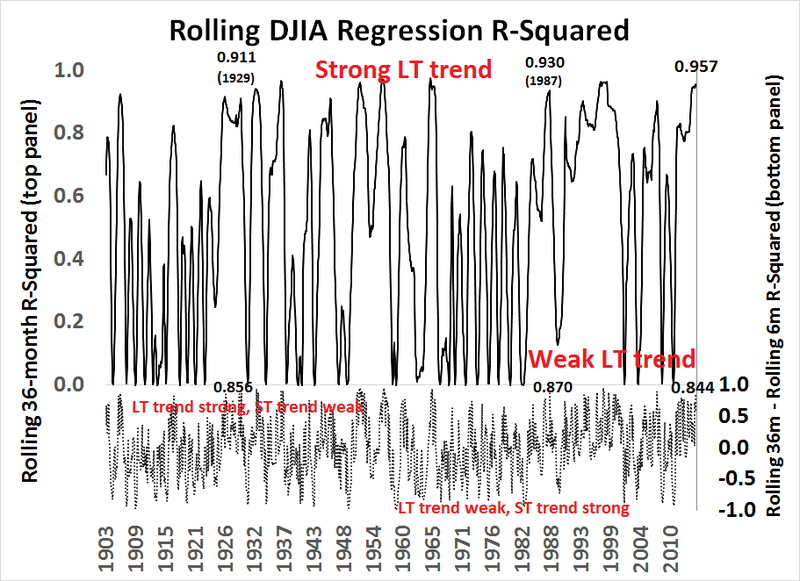 In particular, I have also been watching the DJ Transportation Average as its weakness could be the sign of a Dow Theory sell signal. While the DJTA has been weak, it has been able to hold above a key support level, indicating that the market is still in a holding pattern. So let`s summarize. The market leaders are mainly the glamour, high-beta names. The "engines" of the economy, such as the cyclical industrial and semiconductors, financials and consumer discretionary stocks are not leading the market. 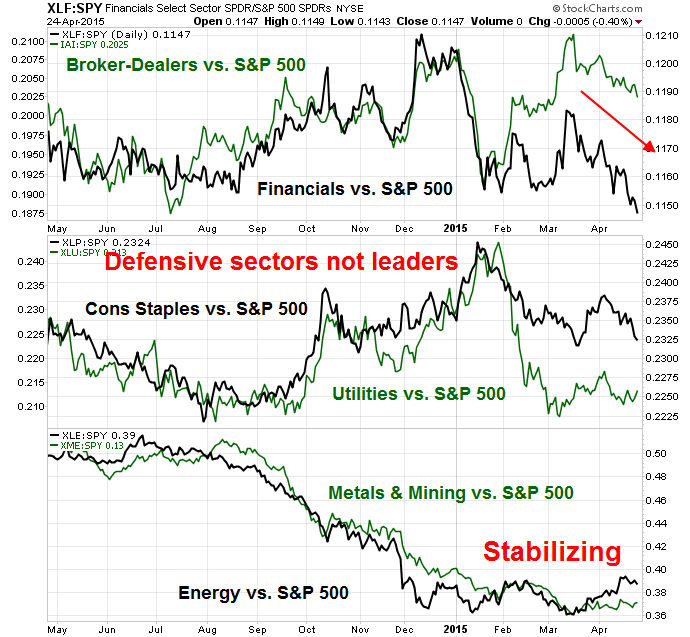 On the plus side, defensive sectors such as Staples and Utilities are not showing signs of leadership either. In other words, Mr. Market is telling us not to expect much from the economy, but don`t get overly panicked because of the lack of defensive leadership. The bull case is that equities haven’t yet reached bubble levels at a time when fixed income is behaving bubbly,2 and that the Fed will support the market. As to the former, it may prove true. We don’t like the proposition of betting on a bubble, though one may yet emerge (or, more clearly, a bubble might expand beyond the current small group of high flying stocks). As to the latter, despite all the attention paid to every utterance of any member of the FOMC, it is clear that the Fed isn’t going to add further accommodation unless conditions deteriorate substantially. How fast it tightens should be less important than the fact that it will tighten. So far, other measures of risk appetite such as HY bonds are indicating that risk appetite remains healthy. However, there may be a minor negative divergence forming as the SPX has gone to new highs while HY bond relative performance has somewhat lagged. This is an indicator that I plan on keeping a close eye on. End of 2013/beginning of 2014: The Dow Industrials fell more than 1,000 points in a month’s time, or 7.3%. February 2015: The Dow Industrials fell 600 points, or 3.2%. To be sure, those are only two data points. But they are consistent with the pattern that has emerged over the past 15 years. As you can see from the accompanying table, the Dow on average has done better following readings of 0% and under when it’s been as high as it is currently. 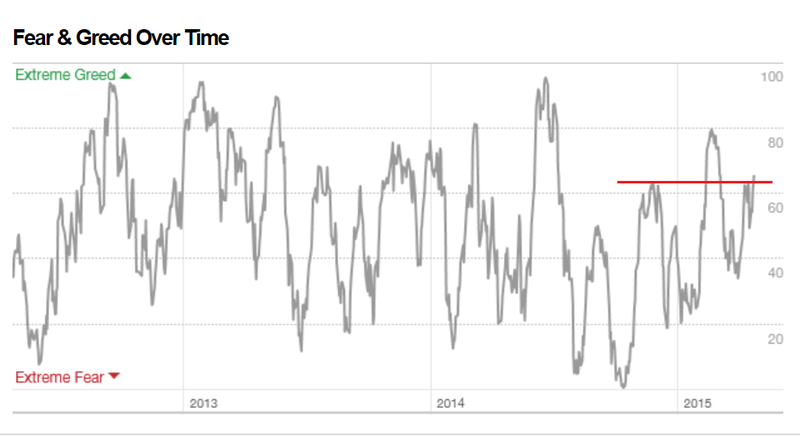 The CNN Money Greed and Fear Index is somewhat elevated. While this index doesn't indicate a crowded long by conventional standards, readings are mildly overbought and at levels where they have reversed course in the last six months. 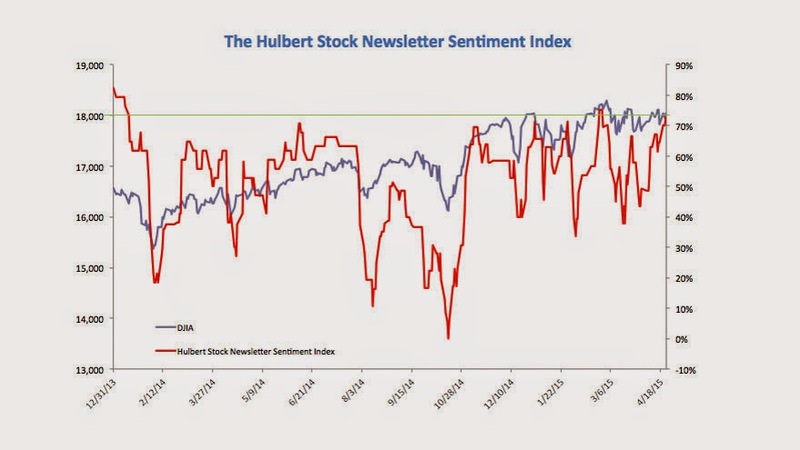 In other words, sentiment is getting frothy. Beware of near-term weakness. 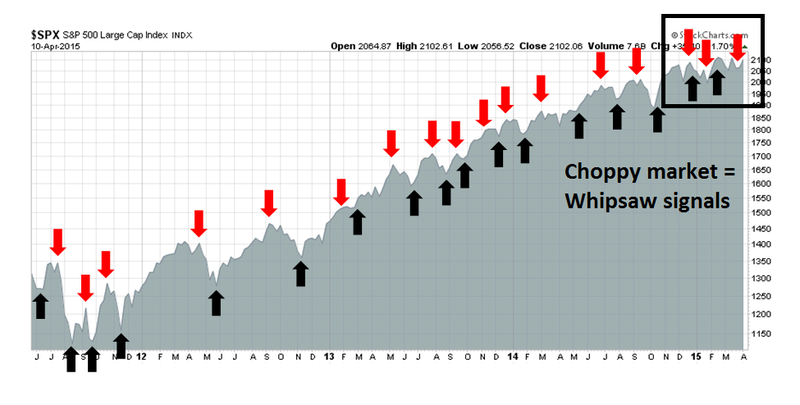 Last week, I wrote that we have seen a pattern of failed corrections and rallies (see Wimpy bulls, wimpy bears?). I suggested that the most likely scenario was a "wimpy bear", where stock prices fell slightly and then rallied. Instead, price weakness promptly rallied to test and breach all-time highs, which made my bear a cuddly koala bear (yes, they have sharp claws but they aren't likely to maul too many people to death). Now that the SPX and COMPQ are at all-time highs, what's next? On Friday, we had buy signals outnumber sell signals for all three of the above indicators, reflecting the recent market strength. Going back to June, 2014, when this has occurred (N=62), the next five days in SPY have averaged a gain of only +.01%, compared with an average five-day gain of +.26% for the remainder of the sample. Clearly, strong readings have not brought near-term strength--though neither have "overbought" readings reliably led to market declines. The failure of strength to be followed by strength is yet one more reflection of the distinction between trend and momentum outlined in the recent post. Conversely, when we've had all three indicators yielding more sell signals than buys (N=49), the next three days in SPY have averaged a gain of +.33% versus +.04% for the rest of the sample. Market weakness has tended to reverse in the near term, though much of that relative performance boost tends to fade over subsequent trading sessions. Despite the "normally" bullish price momentum readings associated with new highs, breadth and momentum readings have been fading. 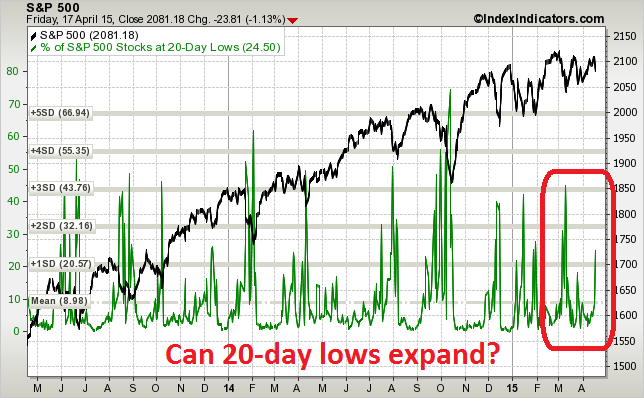 As an example, this chart from IndexIndicators.com of SPX stocks at 20-day highs has been anemic. Moreover, readings weakened even as the index advanced to an ATH on Friday. I interpret this conditions as a lack of buyers, which will be an impediment to further near-term highs. From a even shorter term perspective, this chart of stocks at 5-day highs shows that they reached levels where reversals have occurred this year. 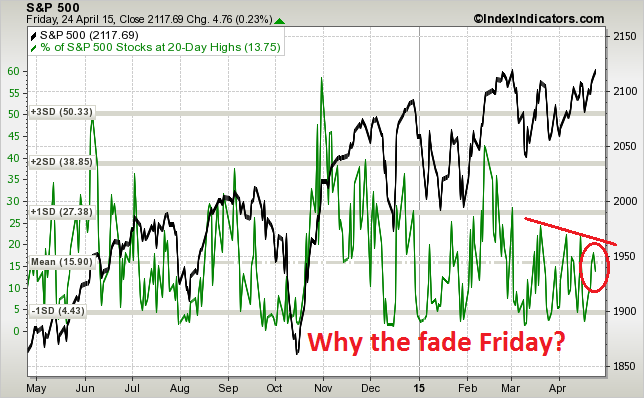 The fade on Friday is an additional ominous signs for the bulls. It would be difficult to get overly bullish at this point. We have a number of binary events next week that could be sources of volatility. First, market heavyweight Apple reports earnings on Monday after the close. On Wednesday, we have the 1Q US GDP, with the consensus being 1.0% growth. On Wednesday afternoon, the FOMC will concluded its two-day April meeting and make its statement public. While the AAPL earnings results is a wildcard, I will be watching the GDP report and FOMC statement more closely. New Deal democrat has reiterated this week his belief that the US is likely to see a "mild industrial recession", though consumer spending remains in good shape. I will be watching carefully the interplay between likely economic weakness and Fed policy. On one hand, many macro indicators are going south. On the other hand, the Fed views 1Q weakness as "transitory" and sees signs of rising inflationary pressures. While some Fed officials have voiced concerns about the effects of US monetary policy on global financial stability, it will be important to see how much the FOMC statement balances these issues. A June rate hike is still on the table, though not likely. However, the risk of a policy mistake is high. 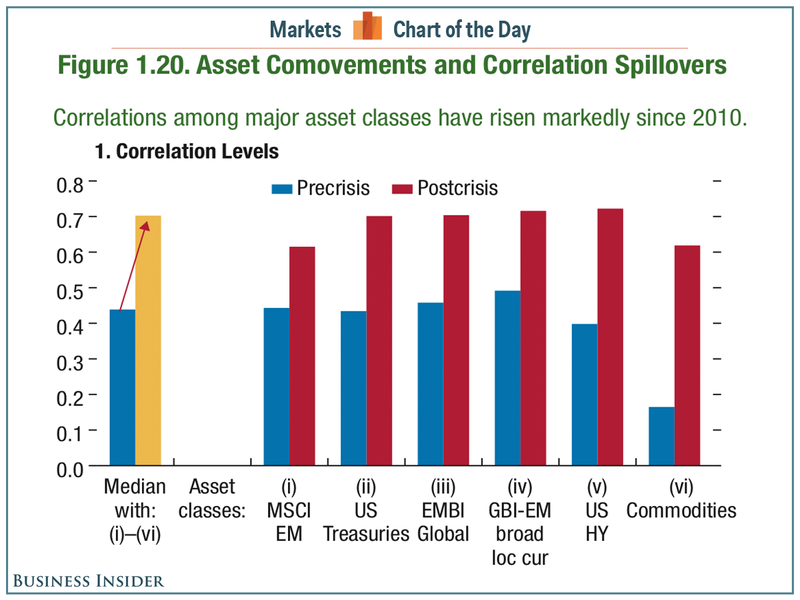 Recent IMF analysis (via Business Insider) shows that asset class price movements have becoming increasingly correlated. A repeat of rate hike anxiety could derail markets in a highly disorderly way. Bottom line: The will be much event-driven volatility next week but the risks are tilted to the downside. My inner investor remains cautious but not panicked. My inner trader remains short. High frequency economic releases have generally been coming in a bit on the soft side, but the signs point to a cautiously optimistic outlook for the American consumer. First, there is the improving employment picture. As well, falling gasoline prices should so provide a boost to consumer spending. As a result, a number of analysts have been bullish on consumer spending. New Deal democrat got somewhat excited over the tick up in Gallup`s rolling poll. As well, Doug Short has indicated that the recent disappointing retail sales figures may be attributable to winter weather. The Atlanta Fed has also suggested that we are seeing a bout of seasonal softness in the Q1 growth statistics. Mr. Market doesn't seem to be buying into the consumer revival theme. 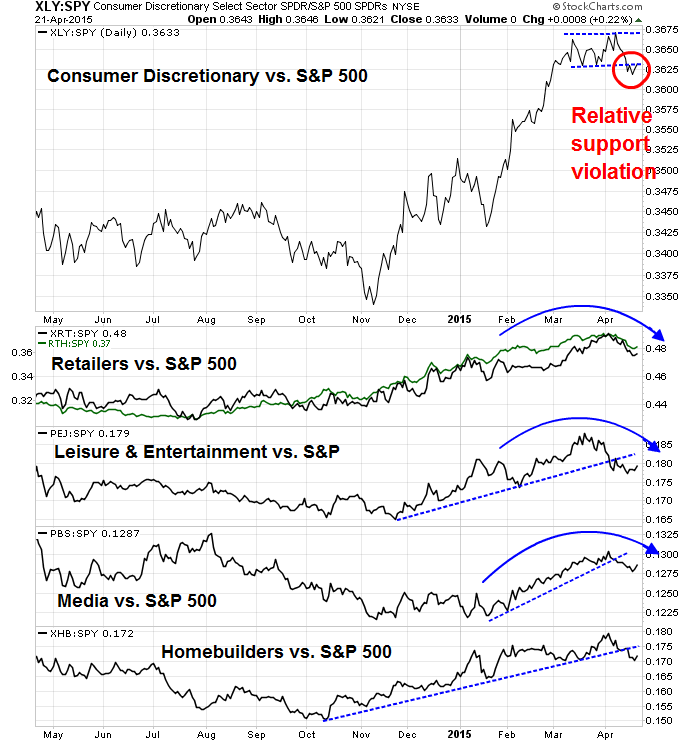 Here is a chart of the relative performance of consumer discretionary stocks against the SPX, along with a number of key consumer spending related industries. In all cases, relative performance seems to be rolling over and I see broken relative uptrends everywhere. There is a disconnect here between macro and technical market expectations. Someone is going to be proven very wrong. Last week, I wrote that I expected that the US equity market would have difficulty making gains because we have seen a pattern of choppiness for 2015 (see Calling an audible (for more choppiness)). On the surface, there were plenty of reasons to be bullish. The earnings outlook appeared positive as consensus estimates were rising again; overseas markets were strong, which indicated global reflation; and last week was option expiry week, which was a historically bullish period. Nevertheless, the preliminary conclusion of a quick tour around the world is supportive of further gains. Non-US markets are rising. In Asia, stock markets are all in uptrends. While the Chinese market is a casino and somewhat divorced from China;s economic outlook, the bourses of China's major trading partners are signaling reflation, or at least the expectation of reflation. (Note that these charts do not reflect the announcement to put limits on margin trading and short selling, which cratered the H share futures by about 5% after the close). Commodity prices appear to have stabilized, which is another indication that global deflationary fears (particularly in China) may be overblown. European markets, though weighed down by the never ending Greek draam and dinged by Friday's weakness, are trending up. The relative weakness of US stocks among the major markets is standing out like a sore thumb in my global review. Despite all these bullish tailwinds the SPX appears to be carving a broad top and violated its 50 day moving average on Friday. The best explanation I can offer, from a technician`s viewpoint, is that we are seeing the early signs of disappointment of investor complacency spawned by the steadily rising stock prices experienced in the past few years. I had previously highlighted a Wells Capital Management study showing how trended stock prices have become and how the trend appears to be overdone. I further extended the results of that study by comparing the long-term (36-month) trend and the short-term (6 month) trend (for more details see How to make your first loss your best loss). The top panel of the chart below shows the rolling 36-month R-squared of stock prices, which shows that the trend is stock prices has been very good - too good. The bottom panel shows the difference between the 36-month R-squared and the 6-month R-squared shows that while the long-term trend is positive, the short-term trend is choppy. These conditions have historically led to market reversals in the past and readings are at levels similar to the ones seen before the market crashes of 1929 and 1987 (though with the caveat that this model is more predictive of future direction, not the magnitude of the move). With that technical backdrop in mind, I have been seeking the fundamental catalysts for a correction for the past few weeks. I have a few candidates in mind. * Risks are shifting from advanced economies, which are gradually healing, to emerging markets, where the variety of ailments include falling commodity prices and side effects of a slowdown in China and internal political tensions. This is, of course, a switch from the Great Recession, when emerging markets were a source of strength amid a financial crisis emanating from the U.S. and (later) Europe. * Financial risks are shifting away from banks, which have strengthened substantially since the crisis, to non-bank financial institutions such as insurance companies and pension funds struggling to get high enough returns to meet their obligations and the rapidly growing portfolios of mutual funds and asset managers. These risks lay out a scenario where Fed tightening could cause havoc in the credit markets, which could cascade into a risk-off rush in all asset classes. Business Insider highlighted the fact that HY default rates are at the lowest levels in history, which can create complacency. There is also the issue of the USD 9 trillion in offshore loans sloshing around the global financial system that is outside the reach of the Fed (see The key tail risk that the FOMC missed (and you should pay attention to)). A Fed tightening could conceivably put HY and EM borrowers at risk. With diminished liquidity in the bond markets, a rush for the exits could cascade into a sudden market crash in the credit markets. 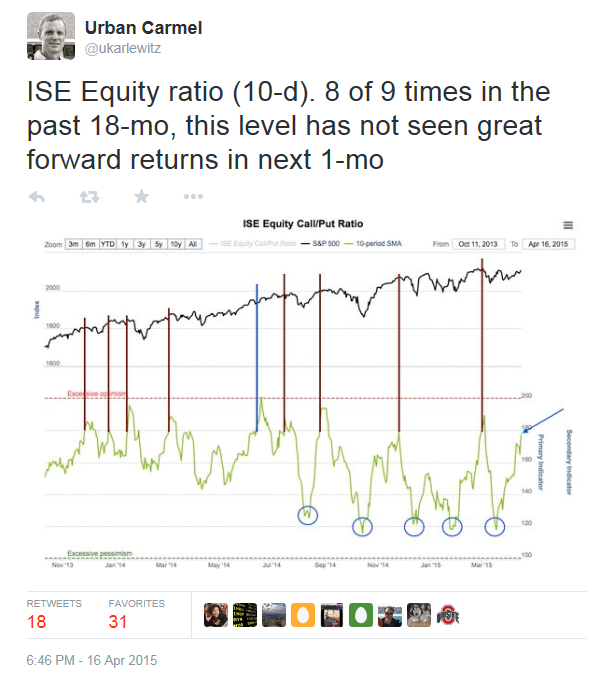 Alas, I am sorry to disappoint permabears as this blog is not Zero Hedge. 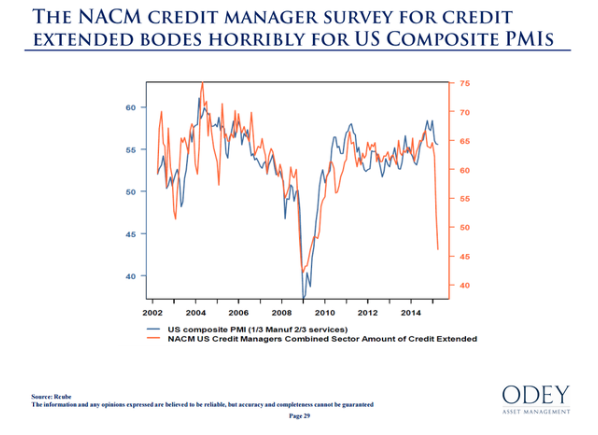 There are no signs of stress from the credit markets at the moment, but I will be monitoring them carefully for signs of rising risk aversion. The second bearish scenario is based on China's stock market speculative frenzy cinubg to a screeching halt. We have all heard the stories. 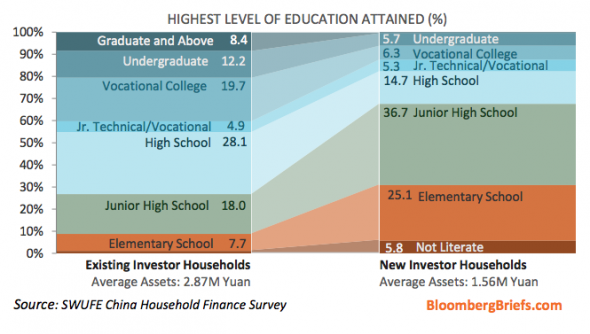 The number of new trading accounts have gone parabolic and about two-thirds of new stock traders in China haven't even graduated from high school (FT Alphaville), valuations look extended (FT Alphaville) and the level of turnover is frantic (CNN Money). You have to understand that the Chinese stock market is not a traditional equity market in the western sense. It`s a casino. There is a Chinese expression describing a stock speculator as someone who "stir fries stocks". Think of the imagery of what happens to the ingredients when you stir fry in a wok and apply it to stock trading. Players care about fundamentals as much as horse players care about the ponies they bet on. Remember the stir fry. Easy come, easy go - and lots of turnover. For now, the Chinese enthusiasm for equities seems to have spilled over from the Mainland to the Hong Kong market. I have been monitoring the charts of the other "Greater China" markets, namely Taiwan, South Korea, Hong Kong and Australia, for Mr. Market's views of the Chinese economy (see chart above). As well, China surprised the market with a 1% RRR cut over the weekend, which is larger than the usual 0.5% cut, which may be a sign of panic. At the same time, a SCMP article entitled "Premier Li Keqiang makes case for deeper economic reforms over stimulus" signaled Beijing's reluctance to embrace more "stimulus", which I read to mean fiscal stimulus and infrastructure spending. Reflecting on the steps the government had taken to cope with a slowing economy last year, Li said it was crucial it had launched reforms to decentralise decision-making and allow the market to play a bigger role. Li attributed last year's successes to this "proactive and creative way to macro-manage". "In a complicated economic environment, we acted calmly, neither tightening up nor easing monetary policies," he wrote. "If we had instead resorted to stimulus measures, not only would things have turned out very differently last year, we would end up having a harder time in the coming years, too. "This is the most fundamental lesson last year's experience has taught us." Li said the government must facilitate more reforms by giving more power to the market. He reiterated his administration's promise to cut the number of permits and initiatives that need government-approval by a third. How will the markets react to the news? Will it focus on the regulatory changes to cool the mania in stocks, or will it focus on the stimulative effects of the RRR cut? Or will it interpret the RRR cut as a technical change to offset the effects of capital outflows, as this comment in a Bloomberg story indicates? Stay tuned. Just one word of advice: Don't just watch what happens to the stock markets in China, but the peripheral "Greater China" markets too. In a recent post, I wrote about how the strength of the USD was posing problems for the EPS growth outlook (see 2015 earnings headwinds in 3 charts). To recap, Ed Yardeni observed that net margin estimates seemed to be peaking for large, medium and small cap stocks. 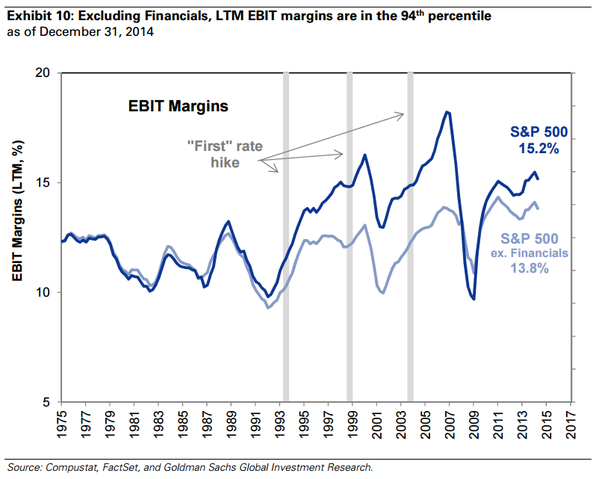 Indeed, this independent analysis from Goldman Sachs shows that EBIT margins are already elevated. If margins do not expand, then sales growth will have to do the heavy lifting if earnings are to grow. 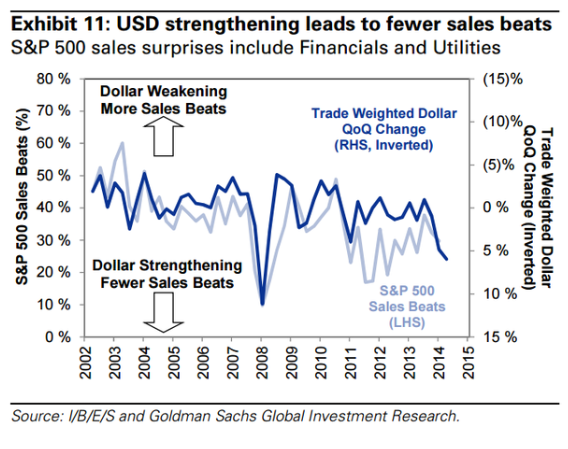 But the strength of the USD is proving to be a headwind for sales growth. The latest update from John Butters of Factset indicates that while the earning beat rate for the young Earning Season was 77%, the sales beat rate was a disappointing 46%. By far, the most cited negative factor in earnings calls has been USD strength. 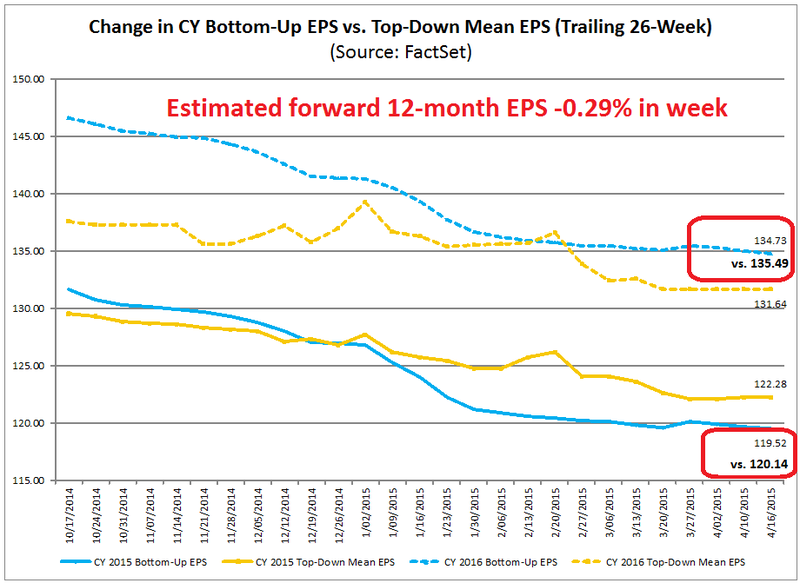 Consequently, EPS estimates ticked down this week. The chart below from Factset depicts the evolution of FY 2015 and FY 2016 estimates (annotations are mine). As EPS estimates have a tendency to fall over time, I calculated a forward 12 month EPS estimate by blending FY 2015 and FY 2016 estimates - and that figure fell by 0.29% in the week. The EPS growth outlook has not been helped by the recent softness in the macro economic data. Industrial production was negative and came in below expectations last week. Retail sales, though positive, missed expectations. 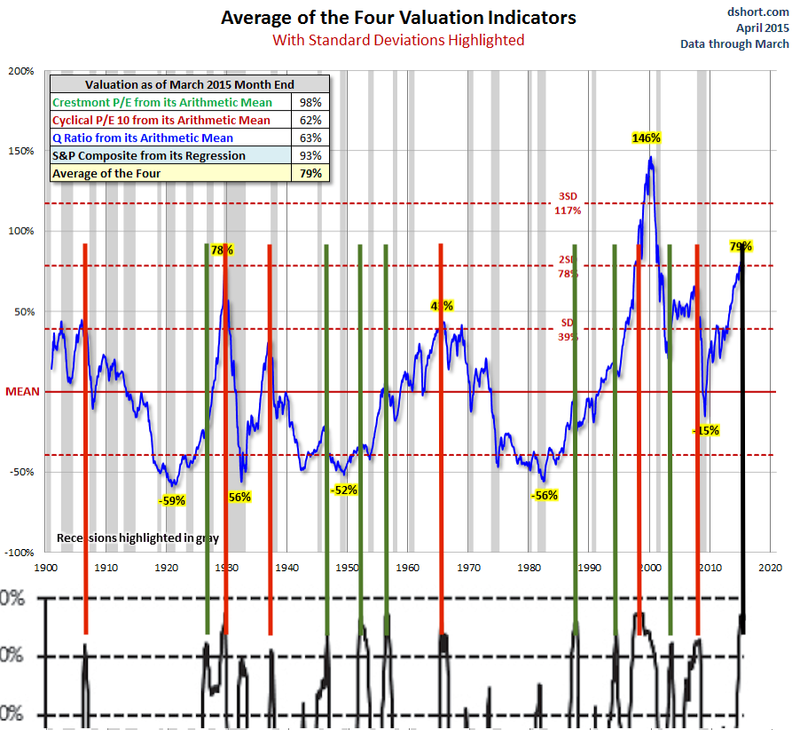 Doug Short`s Big 4 Recession Indicators are now looking a little wobbly. The overall picture of the US economy had been one of slow recovery from the Great Recession with a clearly documented contraction during the winter, as reflected in Q1 GDP. Data for Q2 supported the consensus view that severe winter weather was responsible for the Q1 contraction -- that it was not the beginnings of a business cycle decline. However, the average of these indicators in recent months suggests that the economy is at risk of outright contraction. Retail Sales and Industrial Production have been the source of weakness. We must see these improve in the months ahead to avoid an outright recession. This week modulated what has been the dominant theme of the last several months: poor coincident indicators with positive long and short leading indicators. 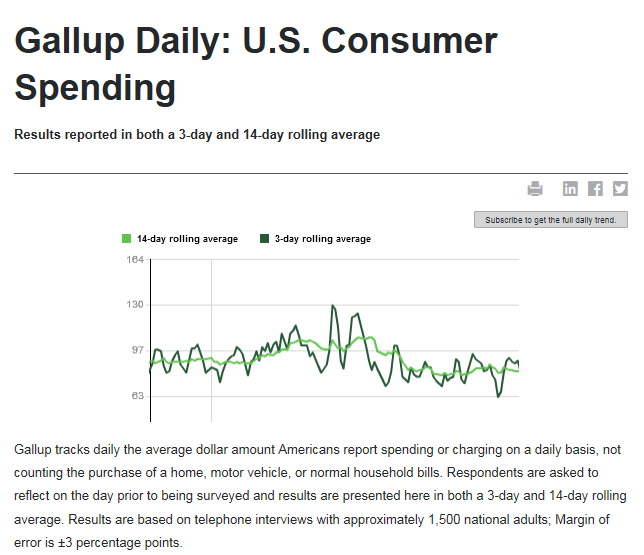 The big positive change was Gallup consumer spending. This measure has consistently earned its bones ever since it correctly showed that consumers were not pulling in their horns during the "debt ceiling debacle" of 2011. Hopefully the improvement is not a one-week wonder. On the other hand, there was a significant new negative in short leading indicators, as temporary staffing unexpectedly declined, which may mean that current industrial weakness is showing up in employment, remembering that hiring leads firing. In summary, there is a shallow industrial recession, but a resilient consumer economy. 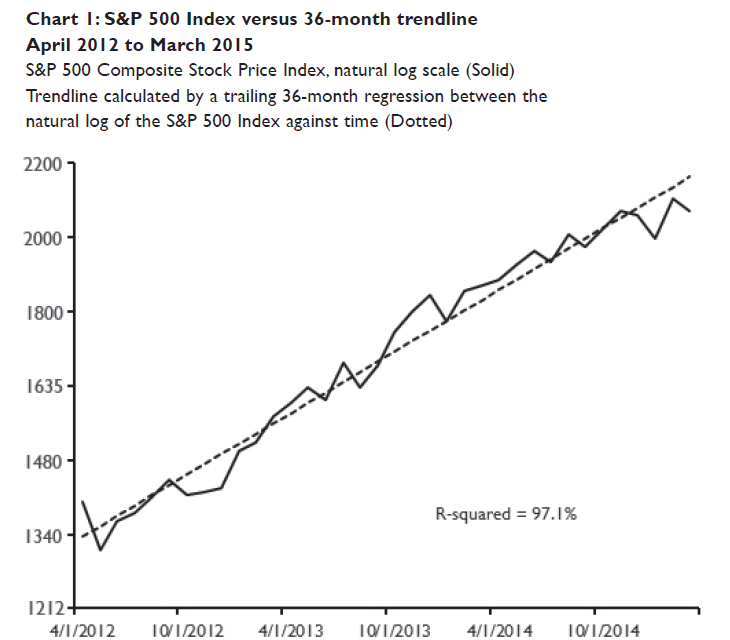 Could that "shallow industrial recession" be the catalyst for a market correction? The week ahead: Wimpy bears? In trying to forecast what might happen in the week ahead, here is the technical framework I am operating under. I have written about how the long-term trend remains strong, but the short-term trend is faltering. These conditions are highly suggestive of an intermediate term top. 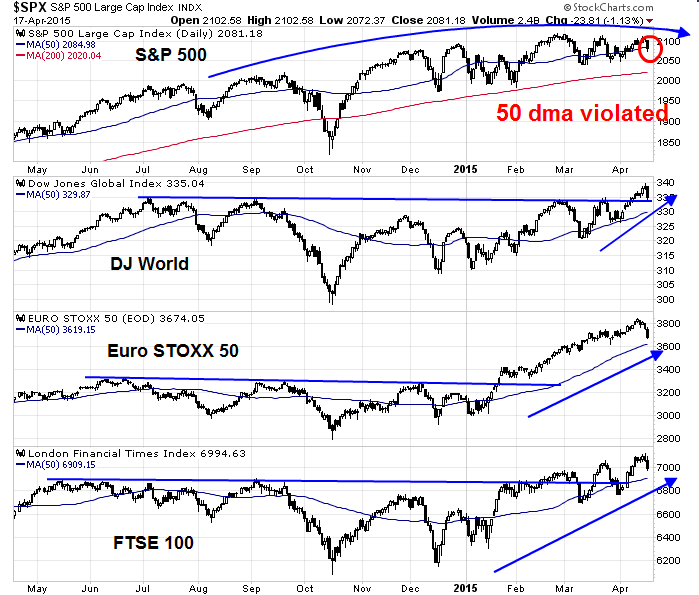 The bottom two panels of the below chart show the % difference between the SPX and the 50 or 200 day exponential moving average (ema). SPX price momentum is fading against the 200 ema and weakness against the 50 ema, which seems to happening now, has resulted in minor pullbacks in the past few months. The big question is "Will the latest round of stock market weakness be consistent with the usual wimpy 2-3% pullback or will it be the start of a major correction?" I have three scenarios in mind, starting from the most likely to the least. My base case scenario (code name "wimpy bear") calls for further weakness into next week, with the decline ending at the SPX support at the 2035-2050 zone, followed by a rally to test the old highs. After such a selloff, it isn't unusual for the market to bounce for the next day or two. However, neither the 5-day RSI nor the 14-day RSI are oversold, which suggests further weakness for the rest of the week. 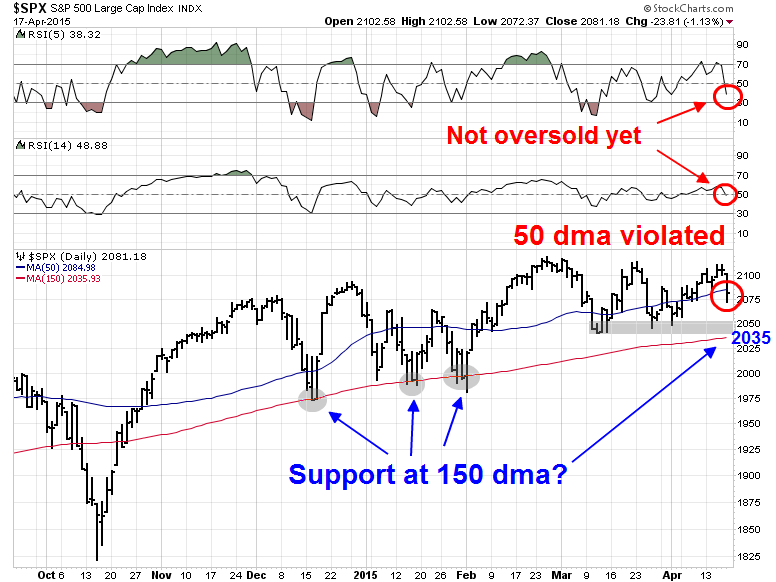 Recent declines have been arrested at the 150 day moving average, which should rise into the 2035-2050 zone next week. The magnitude of such a pullback is consistent with the experience seen in the above chart, where the market has bottomed out at between 1% and 2% below the 50 ema. Since this market has seen more than its share of whipsaws, another possibility is Friday may have marked the bottom and a rally would ensue (code name "koala bear"). Dana Lyons showed that when the market trades in a tight range as it has in the recent past, it has had a tendency to make a marginal new high before correcting. The third and IMHO least likely scenario, is that this is the start of a deeper correction (code name "Ursa Minor"). 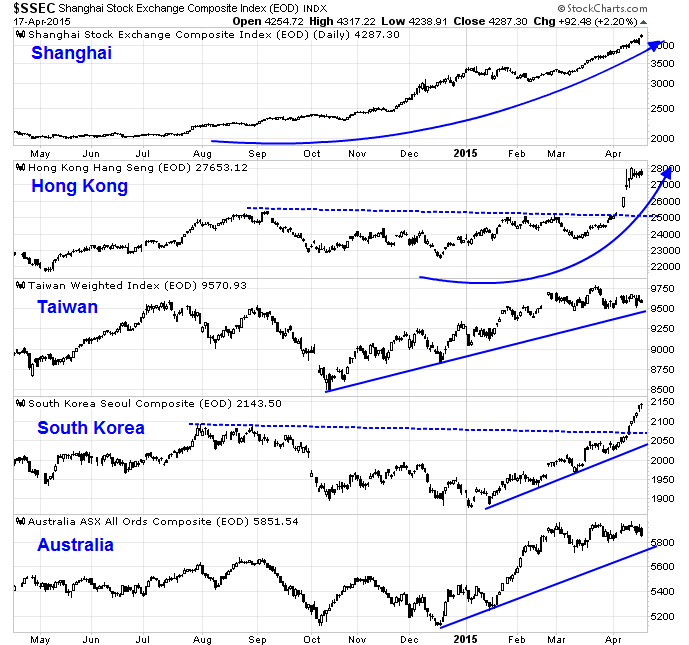 Certainly, the fundamental triggers of a growth scare and possible contagion from Chinese market weakness are there. Brett Steenbarger observed that while current conditions have been marked by the lack of buying, deeper corrections need rising selling pressure, which has been missing. In other words, we need more bearish momentum if the market were to correct further. Here are some of the tripwires that I am watching. 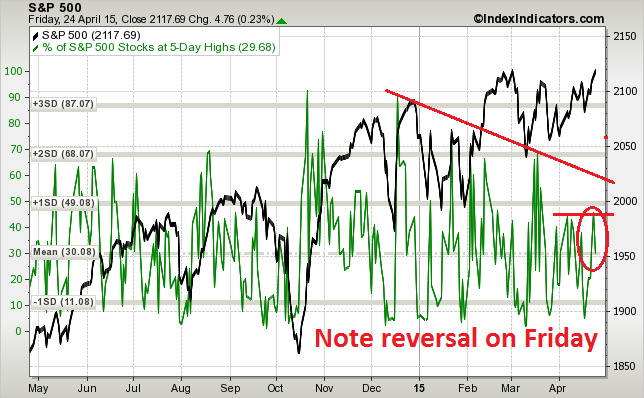 Can bearish momentum assert itself, as measured by an expansion of new lows? In a nutshell, a pre-condition for the onset of Ursa Minor is for the bearish bandwagon to get rolling. While most people monitor sentiment data from a contrarian perspective, in this case I am watching Rydex data for signs of a surge in bearish sentiment. 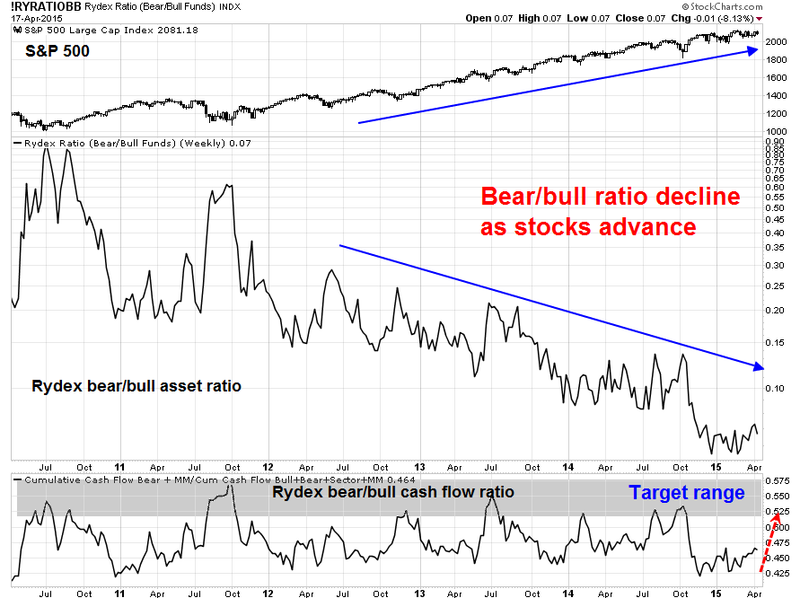 The middle panel of the chart below shows the Rydex bear-bull asset ratio, which naturally declines as stock prices rise and the bottom panel shows the bear-bull cash flow ratio, which is nowhere near a crowded short reading. For a correction to get its spark, we need those lines to start rising. In conclusion, my inner investor remains cautious but not panicked. He is holding his asset allocation at his policy weight as he believes that any correction should be mild, 10% stock market hiccups is kind of risk that you should accept when you invest in equities. My inner trader flattened his short last Tuesday but re-established his short positions at the open on Friday. He has a stop loss at about Thursday`s close. Should the SPX fall to the 2035-2050 support zone, he will be watching for an expansion of bearish momentum as factors in his decision process on whether to cover and take profits. Further to my recent post on how USD strength was retarding EPS growth (see Earnings Season: It's all about the USD! ), Ed Yardeni wrote a timely piece on how forward net profit margins appeared to be declining. As the chart shows, net margins appear to be peaking for large caps (blue line) and they seem to be definitely rolling over in mid and small cap stocks. [P]rofit margins may be peaking across the board, though they aren’t likely to tumble until the next recession. If they have peaked, then profits growth will be determined mostly by revenues growth, which is likely to be below 5% this year and next year. At this point, I got worried. As I pointed out in my previous post, the USD strength seems to be having a negative effect on report sales when compared to expectations. As USD strength continues, how will expectations be for revenue and EPS evolve over the year? Here is the key question: Supposing that margins are flat to down for 2015 (as per Yardeni) and therefore earnings growth will depend increasingly on sales growth (Yardeni), but the relentless strength of the USD is proving to a headwind for sales growth, unless the American consumer steps up and spends wildly (which hasn't happened so far), what will drive earnings growth in 2015? Analysts are also expecting profit margins to continue to expand in 2015. Using the bottom-up sales-per share (SPS) and earnings-per-share (EPS) estimates for the S+P 500 as proxies for expected sales and earnings for the index over the next few quarters, profit margin estimates can be calculated by dividing the expected EPS by the expected SPS for each quarter. Using this methodology, the estimated net profit margins for Q1 2015 through Q4 2015 are 9.8%, 10.4%, 10.7%, and 10.7%. These numbers (starting in Q2 2015) are above the net profit margin for Q4 2014 (10.1%), and are also well above the average net profit margin of 9.4% recorded over the past five years. Both Yardeni and Butters are correct, the difference can be explained by a difference in calculation (and interpretation). John Butters takes a snapshot of current EPS and sales projections and divide earnings by sales to arrive at quarterly margin projections by quarter. He finds that net margins are expected to rise on a quarterly basis. Ed Yardeni calculates the evolution of the forward net margin. For each data point, he divides the forward estimate earnings by forward estimated sales to arrive at a forward net margin for each point in time. This technique is stylistically similar to how John Butters comes up with his forward EPS line (shown in blue) in the chart below. For the purposes of analyzing the expected change in net margins and how they are likely to affect EPS expectations, I believe that Ed Yardeni has the better approach. I have always found that the time when I have learned the most about an investment process is when it does not perform well. 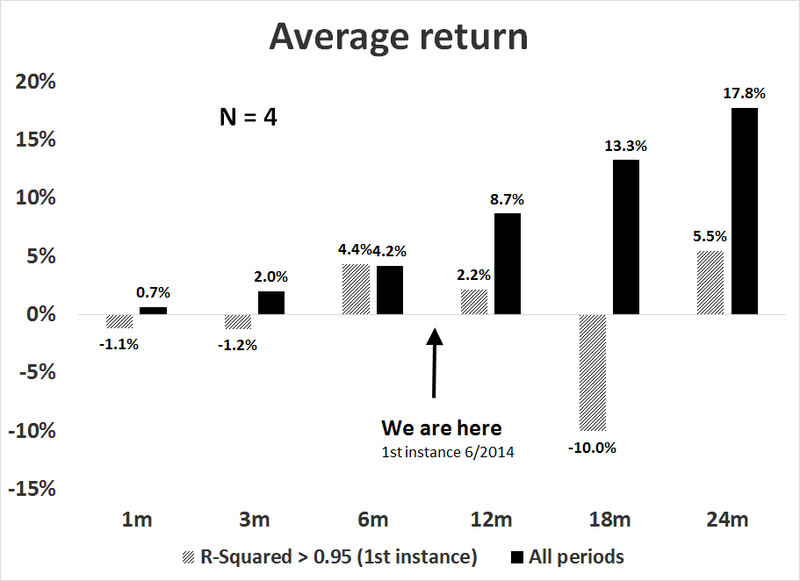 After all, it is during periods of drawdown that the blemishes that appear in a model and no amount of backtesting will warn you of those shortcomings. If you are willing to learn from periods of underperformance, you can, in effect, make your first loss be your best loss. This is a case study of how I learned to diagnose a model`s shortcomings and learn from that experience. In a way, that`s not a surprise. Regular readers will know that the Trend Model is based on the application of trend following techniques to global stock and commodity prices. The price volatility experienced for most of 2015 has led to an environment that is unfriendly to trend following models. Is this just a "feature" of these kinds of models that has to be endured? Maybe not. 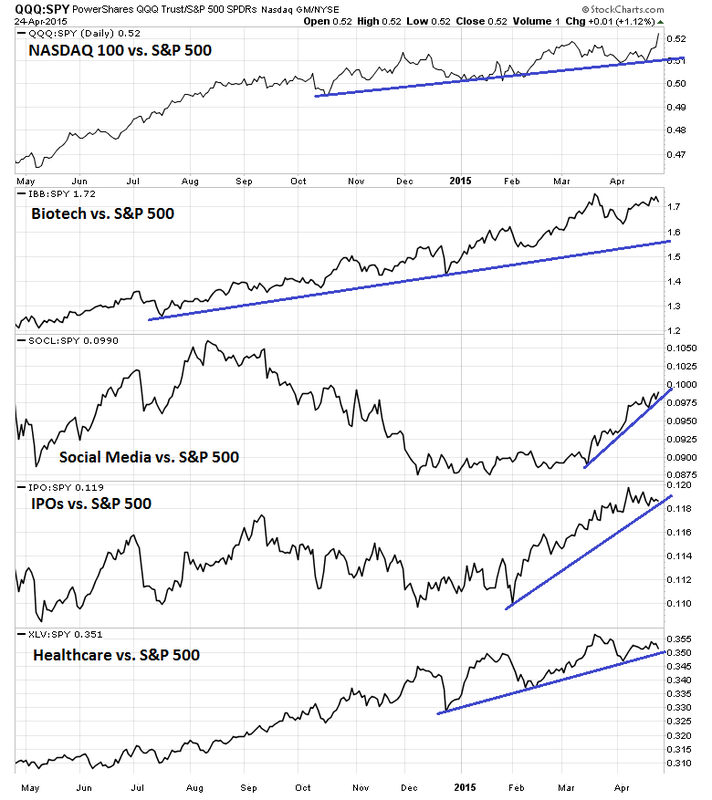 In a recent post (see 3 secrets from the Book of (Trend Following) Revelations), I highlighted a study by James Paulsen of Wells Capital Management showing that the long-term trend in equity prices were getting overdone. Paulsen found that stock prices had more or less gone up in a straight line in the last few years and with only minor corrections. He went on to calculate the rolling three-year R-squared of stock prices and found that they follow cycles of high and low levels of price trends. We just happen to be at the top end of a trending period, which is likely to end soon. When it ends, it will signal an intermediate term top for the US stock market. In a more recent post (see Calling an audible (for more choppy markets)), I reproduced the Paulsen study and further extended some of the conclusions of that research. 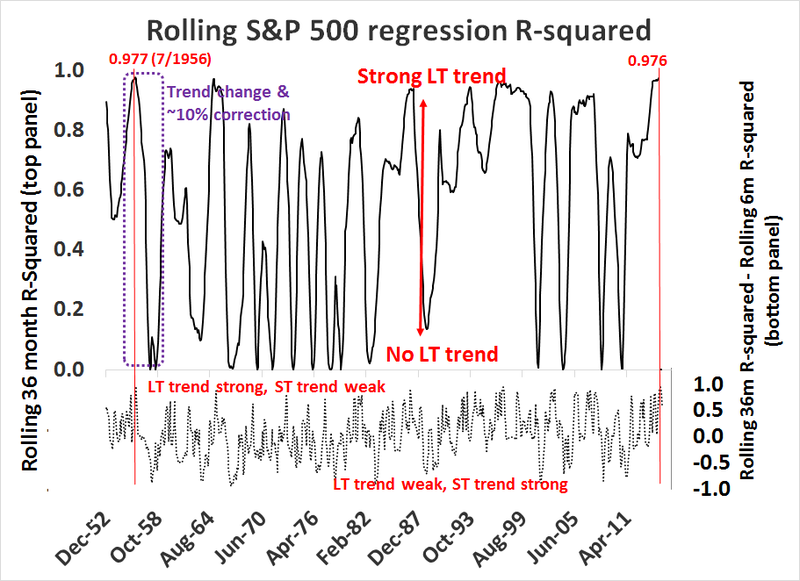 Instead of just looking at the R-squared of 36-month rolling regression, I also examined the R-squared of a 6-month rolling regression as a measure of the short-term trend, largely because my Trend Model uses a much shorter lookback period and it is therefore more correlated with short-term trends than long-term trends. In my last post, I reported that I found that we are in the period where the long term trend is strong (top panel), but the short-term trend is weak (bottom panel). I further showed that stock prices are likely to roll over in the next few months, given how extended the long-term trend is. In addition, the rollover of the short-term trend is likely a leading indicator of the long trend. I am grateful for all the comments, feedback and suggestions that I have received since I started writing on this topic. One of the comments that I received is that the sample size of this study is absurdly low. I could extend the lookback period of the study using data for the Dow, which goes back to 1900, instead of the SP 500, which only goes back to 1950. 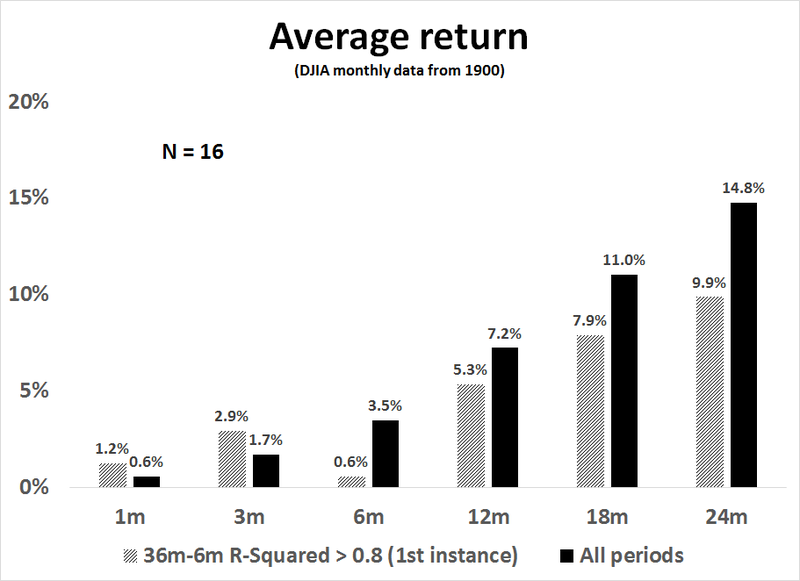 With that suggestion in mind, I reproduced the study using DJIA going back to 1900. Here is the R-squared chart. While the readings are slightly different from the SP 500 study, the longer time horizon revealed some interesting insights. First, the incidence of high 36-month R-squared readings was higher in the pre-1950 period. Nevertheless, the current reading of 0.957 is comparable to the reading of 0.930 in pre-Crash 1987 and 0.911 in pre-Crash 1929. Similarly, the spread between the 36-month and 6-month R-squared readings (bottom panel) is also at a similar order of magnitude when compared to 1987 and 1929. There is an important caveat to remember! This model measures the direction of the move and not the magnitude. Just because the trend is so extended today doesn't mean that a market crash is around the corner. Other episodes have resoled themselves in 10-15% corrections. 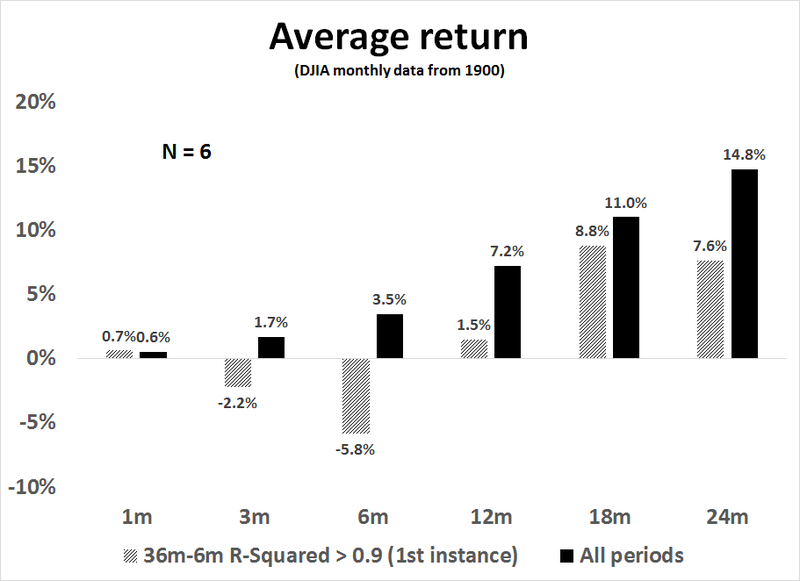 Nevertheless, based on the current 36-month to 6-month R-squared spread of 0.844, I looked at what the return pattern of the DJIA was during past episodes with similar characteristics. The sample size was a more reasonable 16, compared to the minuscule N=4 in the SP 500 study that went back to 1950. The market outperformed initially, but rolled over at between 3-6 months after the first time the spread went above 0.8 (which was March 2015). And if the trend got even more extended and the 36 to 6 month spread went to 0.9? The results were more dramatic, as the market declined almost immediately. First, the good news. All 9 of the prior ranges saw the SP 500 eventually go on to make new highs, though some initially broke the range to the downside first. 2 months later, 8 of the 9 instances saw the SP 500 not only higher but at a new 52-week high. Only the 2007 instance saw the index lower 2 months later, although it was at a new high 3 months afterward (and it had made a new high immediately following the range break). Now the not-so-good news. On 5 of the 9 occasions, the new highs were very small and very short-lived. Following occurrences in 1965, 1976, 1983, December 1993 and 2007, the market’s upside “breakout” resulted in tops shortly afterward that would predominantly hold for the following year. Only the occurrences in 1951, 1964 and 1995 saw the market persist at new highs for an extended period of time. Furthermore, only 1995 saw the SP 500 continue on to double digit returns over the following year. In other words, the market did perform well initially, just as my analysis shows, but they more often than not marked a significant intermediate term top. 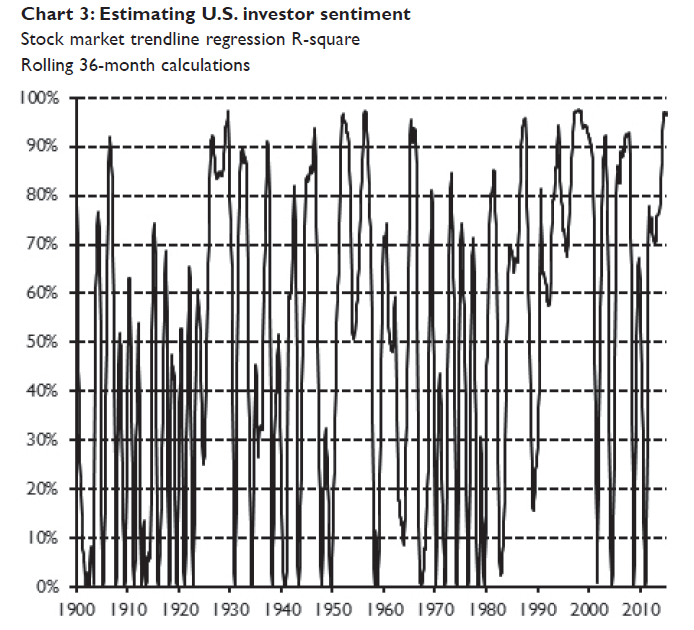 My research results using DJIA data going back to 1900 confirm the conclusions of past studies. We are in an environment where the long-term trend is strong but starting to weaken. 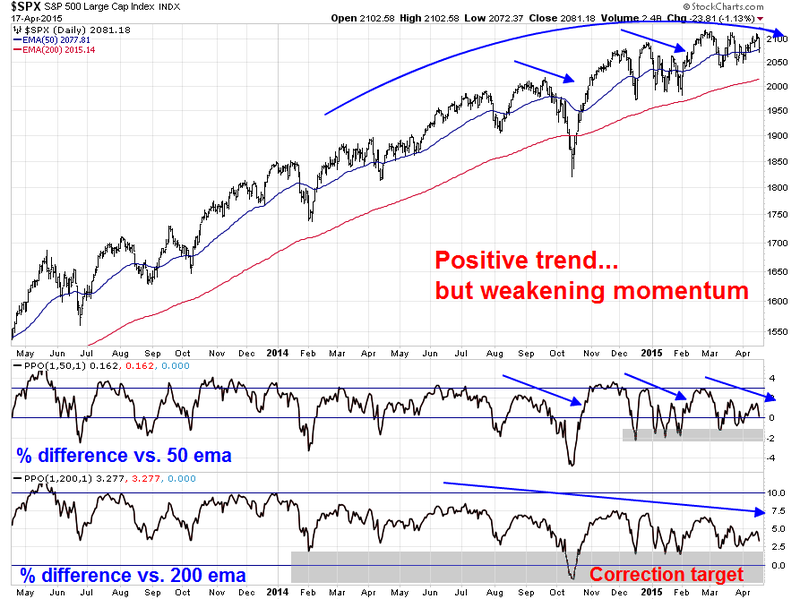 The weakness is evidenced by a faltering and choppy short-term trend, or price momentum. Status quo: Continue to run the Trend Model as is and accept the drawdowns as a "feature" of the model. Wait for a friendly environment: Go to cash and wait for signs that the trending environment has re-established itself. Focus on the long-term trend and ignore the short-term trend: Most trend following models use a long term moving average to define the trend, e.g. 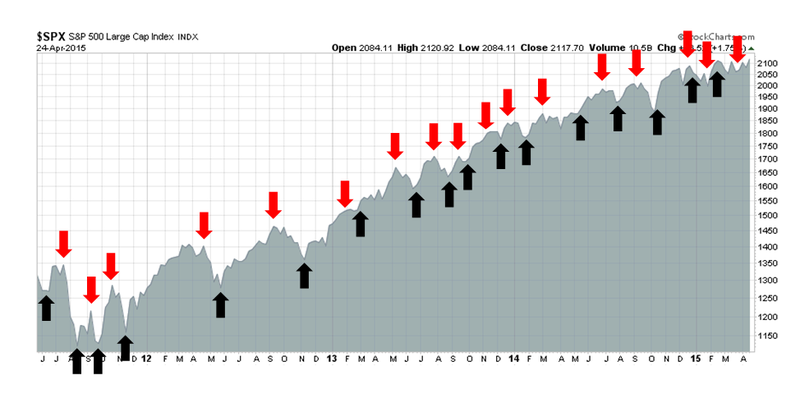 200 days, and a short-term moving average for risk control, e.g. 50 days. This approach would throw away the shorter (50 dma) and focus on the longer (200 dma) for trading signals. Focus more on counter-trend models. Examples would be contrarian sentiment models looking for crowded longs and shorts, as well as overbought-oversold trading models. I rejected options 1 and 2 out of hand. Following the status quo is an example of not learning about the investment process and not allowing your first loss to teach you a lesson. Going to cash is a cop-out and detracts from learning. I did consider option 3 seriously, but rejected it as it would result in excessive return volatility because of it strips away the risk control element out of the investment process. I wound up adopting a version of option 4. I would focus on one side of the counter-trend models by fading strength (but not buying weakness). As my analysis indicates that the long term trend is turning and the decline from an intermediate term top could only be weeks away, buying weakness is the equivalent of picking up pennies in front of a steamroller. Selling strength when the market is overbought, on the other hand, is likely to be a higher percentage play. In conclusion, this is a case study of how I learned about a model from drawdowns. When I interviewed investment managers in the past, I have always asked the acid test question about how they have learned, "Under what circumstances would your investment approach fail?" If the manager has thought sufficiently about his strategy and he has learned from past mistakes, he will give an intelligent answer. It also shows that he sufficiently understands the kinds of bets that he is making, why it works and when it might fail. That`s how you learn to make your first loss your best loss. Earnings Season: It's all about the USD!